In September 1984, the voice that had spoken for one of the most profound and prolific metaphysical teachers of the 20th century fell silent. Seth, the entity who described himself as an “energy personality essence no longer focused in physical matter,” had spoken exclusively through Jane Roberts since 1963. During the long illness that led to her death, Jane continued to channel Seth from her hospital bed, but this final work was left unfinished. Now, in The Way Toward Health, Jane’s husband, Robert Butts, shares with us the intimate story of Jane’s final days, and the exquisite teachings that Seth gave during that time. 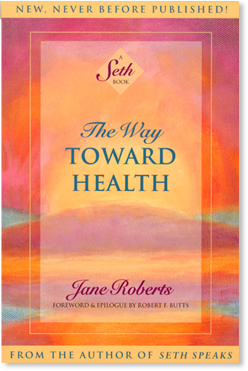 The Way Toward Health is an in-depth examination of the miracle of life in a human body, woven through the poignant story of Jane Roberts’ courageous attempt to understand why she had contracted the crippling condition that ultimately led to her death. The material in the book was evoked by the questions and considerations Jane and her husband Rob faced during her long illness. The will to live can be compromised by doubts, fears, and rationalizations. Some people, for example, definitely want to live, while they try to hide from life at the same time. Obviously, this leads them into conflicts. Such people will impede their own motions and progress. They become overly concerned about their own safety. If any of my readers feel this way, they may even hide these feelings from themselves. They will concentrate upon all of the dangers present in society in their own country, or in other portions of the world, until their own frightened overall concern for safety seems to be a quite natural, rational response to conditions over which they have no control. What is actually involved is a kind of paranoia, which can become such a powerful response that it can take over a person’s life, and color all projects. If this has happened to any of my readers, you might recognize yourself in any number of different scenarios. You might be a “survivalist,” setting up stores and provisions to be used in case of a nuclear disaster. It may seem to you that you are quite justified in protecting yourself and your family from disaster. In many such cases, however, the people so worried about the occurrence of danger from the outside world are instead concerned about the nature of their own energy, and afraid that it might destroy them. In other words, they do not trust the energy of their own lives. They do not trust the natural functioning of their bodies, or accept this functioning as a gift of life. Instead they question it at every point — even holding their breath at times, waiting for something to go wrong. They are not forgotten, but the people involved simply close their own eyes, so to speak, to those decisions, and pretend (underlined) that they do not exist, simply to make their lives appear smooth and to save face with themselves, when they know very well that the decisions really rest on very shaky ground indeed. I do not wish to simplify matters, but such decisions can be uncovered very easily in children. A child might fall and badly scrape a knee — so badly that limping is the result, at least temporarily. Such a child will often be quite conscious of the reason for the affair: he or she may openly admit the fact that the injured part was purposefully chosen so that a dreaded test at school could be missed, and the child might well think that the injury was little enough to pay for the desired effect that it produced. An adult under the same circumstances might become injured to avoid a dreaded event at the office — but the adult may well feel ashamed of such a reaction, and so hide it from himself or herself in order to save feelings of self-esteem. In such cases, however, the adults will feel that they are victims of events over which they have little or no control. If the same kind of event occurs with any frequency, their fear of the world and of daily events may grow until it becomes quite unreasonable. Still, in most such instances those inner decisions can be easily reached — but while people are determined to “save face,” they will simply refuse to accept those decisions as their own. People will to live, to act or not to act, to a large extent theywill the events of their lives — whether or not they are willing to admit this to themselves, and they will to die. Chapter 3: Daredevils, Death-Defiers, and Health.